The SmartOakland Coalition, Californians, the nation, and everyone who cares about health, housing, and the environment scored a huge win yesterday thanks to the tireless work of CA Lawmakers who were successful in blocking the lead paint manufacturer's ballot measure to make Californians pay to clean up poison paint created and sold which now exists in millions of homes in CA built before 1978. It was shocking to learn, earlier this year, the paint companies were even attempting this action to confuse the public into thinking they should pay for lead paint poison clean up. Their attempt was veiled using terms like, "Healthy Homes & Schools", initiatives, among many other euphemisms, that would have switched financial responsibility to CA constituents to the tune of $2B and release lead paint manufacturers from any responsibility in causing state-wide lead poisoning. The Sacramento Bee reposted the Associated Press Article here, and we've included their story here in case you want to read it in this window. 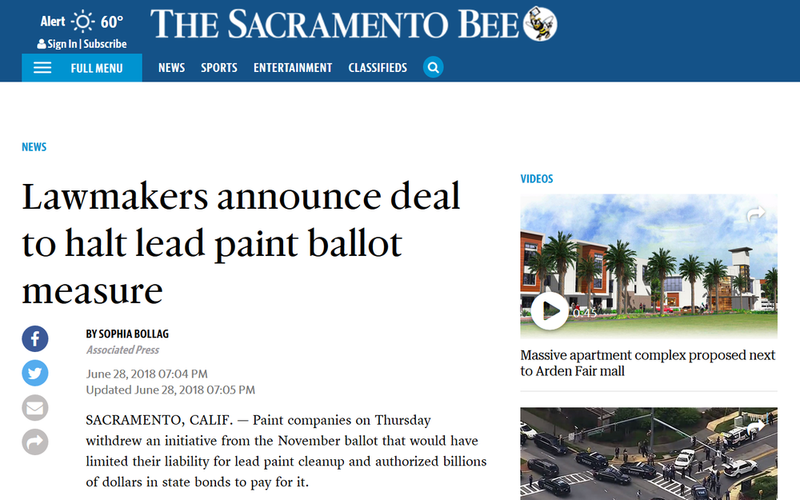 Paint companies on Thursday withdrew an initiative from the November ballot that would have limited their liability for lead paint cleanup and authorized billions of dollars in state bonds to pay for it. The decision came just ahead of the deadline to withdraw initiatives. Legislative leaders said it was the result of talks to avoid an expensive initiative battle and "ensure a thoughtful process to address the significant problems arising from the existence of lead paint in older homes across the state." Lawmakers, the paint companies and other interested parties agreed to work together toward a resolution before the end of the legislative session in September, Assembly Speaker Anthony Rendon and Senate President Pro Tem Toni Atkins, both Democrats, said in a statement. "We appreciate the efforts of all involved," they said. Kendall Klingler, a spokeswoman for the paint industry's ballot measure committee, said in a statement that the group will work with lawmakers on a policy "putting more money in the hands of homeowners faster through a responsible statewide program." Three major paint companies financed the initiative after court rulings declared lead paint to be a public nuisance and required them to pay for cleanup. The ballot measure would have shifted the cost to clean up homes from the paint companies to California taxpayers. Democratic lawmakers agreed to drop at least some of the half-dozen bills they'd introduced targeting paint companies in retaliation for the initiative. Other issues remain under discussion, including liability for homes that were not part of the court case, said Assemblyman David Chiu, D-San Francisco. "Let's not forget that the real issue here is getting lead paint out of homes," said Assemblyman Tim Grayson, D-Concord. Courts ruled in favor of 10 California cities and counties that argued ConAgra, NL Industries and Sherwin-Williams knowingly endangered public health by advertising and selling lead paint. A Santa Clara County judge found lead paint to be a public nuisance and required the three companies to pay $1.15 billion for abatement. A state Court of Appeal in November upheld the finding of public nuisance but said the companies only have to pay for abatement in homes built before 1951. The final bill for those homes has not yet been determined but is expected to reach into the hundreds of millions of dollars. The industry-backed ballot measure would have declared that lead paint is not a public nuisance, wiping out the liability from the existing lawsuit and any others filed by other cities or counties under the same legal theory. It included a $2 billion bond for lead abatement to be repaid from the state general fund for an average of $110 million a year for 35 years. Oakland National Night Out District 4 Melrose High Hopes NCPC 27X Using GTLO Pilot!